To close out the awesomeness of Women Entrepreneurs Month, we sat down with Arlene Daley, co-author of The Not-So Secret Society. You can see her above in her animated and true-to-life forms! She told us all about how she decided to write a book with her husband and how they went about actually getting it published. If you have elementary school-aged children, you should just head on over to Amazon and pre-order the book right now, because all the kids are going to be talking about it at school this fall. Work Kids Wine: Hi Arlene! Thank you so much for taking the time to speak with us. 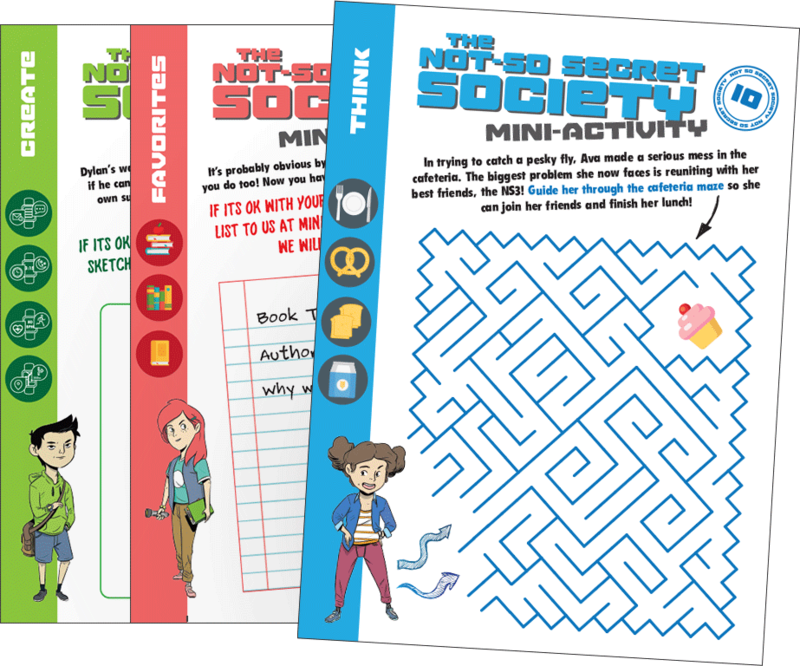 Can you tell us how you decided to write The Not-So Secret Society? We know you had a previous career so we’d love to hear about why you decided to change directions. Arlene Daley: We wanted to write the book for a while. For years Matt and I had the idea for the story of five kids who have adventures. But I wanted it to be more than just a fun story. I taught English for about five years, then worked in child therapy for about ten years, working with children in grades K-12. So I’d say my education background feeds into the book and helps differentiate it from a lot of what’s out there. WKW: You provide a lot of bonus material with the book, right? AD: Right! The book coordinates with common core and it comes with activities that parents and teachers can use to help extend the learning process. It also has full common core-aligned lesson plans that we created in conjunction with teachers, so if they want to use the book in the classroom they’re not starting from scratch. WKW: That’s amazing. Was that part of your pitch to publishers? AD: Actually we [Arlene co-wrote the book with her husband Matt] only went to one publisher! Matt worked with Boom! Studios before on the Lantern City series, so we brought the idea to them first. They loved it because the book has a diverse cast of children and takes place in an urban setting. They were looking for a new project for middle-grade readers, and Not-So Secret Society fit into that space. So we ended up doing the project with them as a graphic novel. WKW: That’s fantastic. OK so once you had your publishing deal, you had to actually write the entire graphic novel. What was that process like? Was it challenging to write with your husband? AD: [Laughs] Matt is pretty easy to work with. I would generally take the first pass and create a very detailed outline of where each section of the story should go. Matt would build out the dialogue from the outline and we’d edit it together. It was a true collaboration between us. WKW: What was your editor’s role in the process? AD: Our editor has been great. After we’d finish two or three sections, we’d send it in and get constructive feedback sent back to us. The editor really played a role in making the book work as a whole and making it more sellable. Actually I think our editor was probably more involved than most, because before launching the book itself we released a series of mini comics. WKW: That’s so cool. Can you talk a bit more about that? AD: Of course! Starting this past January, we released one mini comic per week on our website, along with an accompanying activity. Those were a blast to write. Because they were one-pagers, we could be a little more silly and crazy with the characters’ adventures. And we got to work with seventeen different artists, which I loved. I really went back and thought about what it was like to be a kid, what mattered to me when I was ten years old. And we tried to bake those experiences into the mini comics. We got to be as creative as we wanted. I loved it. WKW: If the mini comics were the best part, what part of the process has been the most challenging or surprising? AD: The artwork! Before this whole experience, I wasn’t really familiar with the graphic novel world. Matt and I had final control of the text, but not the artwork. I’d have an idea of how something would look, then we’d get the draft and the reality would be completely different from what was in my head. That was a struggle for me, to give final control over the appearance to someone else. WKW: As fellow control freaks, we empathize. So where do you go from here? AD: Now we’re focused on marketing the book. Our publisher has been very supportive – we recently had an article about the book in Publisher’s Weekly, and we’re gearing up for several big conferences. Our hope is that we can expand The Not-So Secret Society to a three-book series. We have two more stories ready to go. WKW: We want that for you too, so our kids can read all three! Last question: do you have advice for other aspiring authors? AD: Of course I do. Make sure you find yourself a really good home, a really good fit with your publisher. If you don’t feel like it’s the right home for you, you should move along. Because you’re going to be working a lot with those people. And more importantly, stick with it, because it can be a very daunting process. Don’t give up even if you feel like no one likes your story, or it’s too specific. Your story is meant to be out there. Someone will like it. The Not-So Secret Society is available for pre-order on Amazon and Barnes & Noble, and will be available in bookstores everywhere on August 1, 2017.